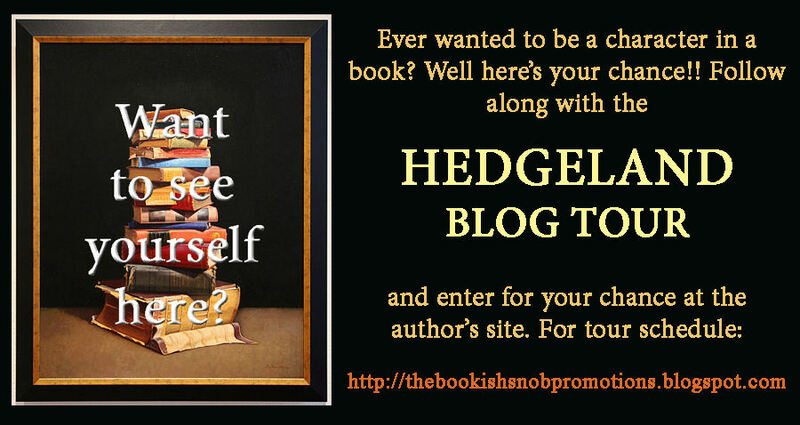 The Hedgeland Book Tour stops by Reader Girls today. What is Hedgeland, you ask? 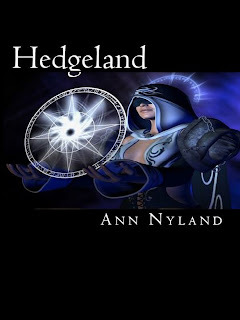 Hedgeland, is an urban fantasy of time travel. Dr April Neuland, a Professor of Ancient Languages turned non-fiction writer, has been plagued by dreams all her life, dreams of her past life in the Otherworld. Meanwhile, in a parallel dimension of April's past and Caridwen's future, Worthing, a Future History Professor, has allied with the Military to access Future Internet communications and use new technology to influence April to write an ebook novel revealing where she, in her past life as Caridwen, hid the Kiste, a device to travel through time and space. Hedgeland weaves all three time/space frames: Caridwen, Worthing, and April. Hedgeland is the first in the Hedgecraft Sequence, but is a fully self contained novel with no cliff hangers. Author Dr Ann Nyland was on Faculty at the University of New England, Australia. She is a grammar pedant, ancient languages translator, and best selling non-fiction author of such books as The Complete Books of Enoch; Angels, Archangels and Angel Categories: What the Ancients Said; The Book of Jubilees; A Devil of a Job to Find Satan in the Bible, among others. We welcome Dr. Ann Nyland! Today, we have several novels about the Seelie Court and Unseelie Court. It was Scottish mythology that had the two courts; the Irish did too although nowhere near to the same degree. Basically, the Seelie Court was favorably disposed to humans and the Unseelie not so favorably, but it wasn't anywhere near so cut and dried. Some people think of the Faerie (known in Ireland as Sidhe - pronounced shee) as tiny little winged creatures covered in sparkles, yet the beliefs of ancient Ireland were quite different. The Irish said that Faerie were as tall as people today, that the Sidhe would travel across water to their Otherworld on the Western ocean, that Irish mounds - also called sidhe - were considered a place to cross into the Otherworld. This ties in with the European idea of the 'hedgerider,' someone who could cross between worlds. Faeries in fact were originally said to be the Tuatha Dé Danann of Ireland who were able to travel between worlds. Irish mythology holds that the Tuatha Dé Danann came to Ireland in flying ships but were unable to land because their enemies, the Fomorians, had set up a powerful energy field. The Tuatha Dé Danann eventually went into another dimension via one of those mounds still to be seen in Ireland. The ancient Celts believed that the Otherworld, in which Faeries live, is not separate from ours, but overlays it. There are places where the two worlds sometimes meet and these were believed to be natural power spots, bridges between the worlds. The ancient Irish marked these spots where the two worlds overlapped with piles of stones. The records of witch trials in the UK show that there are plenty of cases where accused witches said that their powers came from the faeries. There was a famous witch by the name of Biddy Early who said that her healing powers came from the faeries. She could see the future in a blue bottle, and when she died in 1873 the bottle went missing - people said the faeries had taken it back although another source said a priest threw it into the lake behind her cottage. She was famous for using her potions to heal animals and people. She was accused as a witch in 1865, but acquitted. In 1566, John Walsh of Netherberry in Dorset said in court that he would go to the hills where there were mounds of earth, and speak to faeries between the hours of one and noon, or at midnight. A 1929 book called Witch Hunting and Witch Trials by C. L'Estrange Ewen gave figures for the number of witches killed in Western Europe during the sixteenth and seventeenth centuries - 100,000 for Germany, 3,000 to 4,500 for Scotland, and a bit less than 1,000 for England. A 1718 book by Francis Hutchinson, An Historical Essay concerning Witchcraft, reported that the earlier Puritan writer John Penry of Wales spoke of numerous soothsayers and enchanters who said they met faeries on Tuesday and Thursday nights. Scottish witch trials had many accounts of the Faerie Queen, or Queen of Elfhame - that's Elf Home, Otherworld. Isobel Gowdie said that she met the Faerie Queen when she went into certain hollow hills. In 1588 Alison Pearson was condemned for meeting with the Queen of Elphame, and it was said that the Faerie Queen sent messengers to summon possible witches. In 1616, Elspeth Reoch of Orkney said that she had met a faerie man who offered to teach her anything she wanted. In the 1600s, in the North of England, a man was charged with witchcraft. He said he used a powder to heal sicknesses, and offered to lead the court to the faerie hill where he had acquired the medicine. He had discovered the hill when he was penniless. A woman had appeared to him and had led him to a hill and she knocked on it three times. The hill opened up and they went in and found a faerie queen with many attendants. The faerie queen gave him a box full of white powder, and told him he would be able to heal anyone if he gave them two or three grains of it. The Judge asked him if the faerie queen's hall was light or dark, and the man said it was like twilight. He said when he wanted more powder, he went to the hill and knocked three times, and said, "I am coming; I am coming." The hill would open, and the woman would take him to the queen. There were many similar stories of witches gaining their powers from faeries all over Ireland, Wales, Scotland and England. One lucky reader who follows the tour will win the opportunity to become an actual character in one of Nyland's upcoming books. You can find Hedgeland at Amazon, Barnes & Noble and other book sellers. 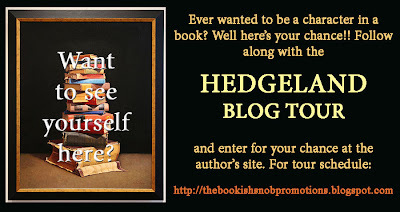 For a list of the blogs participating in the Hedgeland tour, go here. Thank you Dr. Nyland for stopping by today and thanks to The Bookish Snob Book Tours. Meg, Caitlin and Laurie, thanks so much for hosting this stop! Sounds like you live in a fascinating area -I'm envious! I absolutely loved this stop!